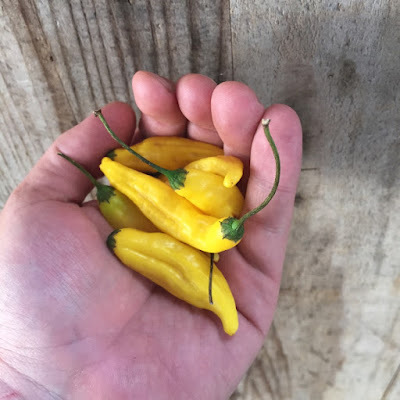 I'm really excited to get into our first batch of fresh Aji Amerillo chiles. Having growing up in northern new Mexico, I'm a bit of a chile connoisseur. These bright yellow chiles are prevalent in Peruvian cuisine and I fell in love with them during my visit to Lima last year. Unfortunately, they are nearly impossible to find fresh here in California. While the Aji Amarillos are quite spicy, they are also fruity with a bright flavor and pleasant sweetness. It seems like as Peruvian food becomes more popular in California, local farms are rising to the occasion - which is great news for chefs!